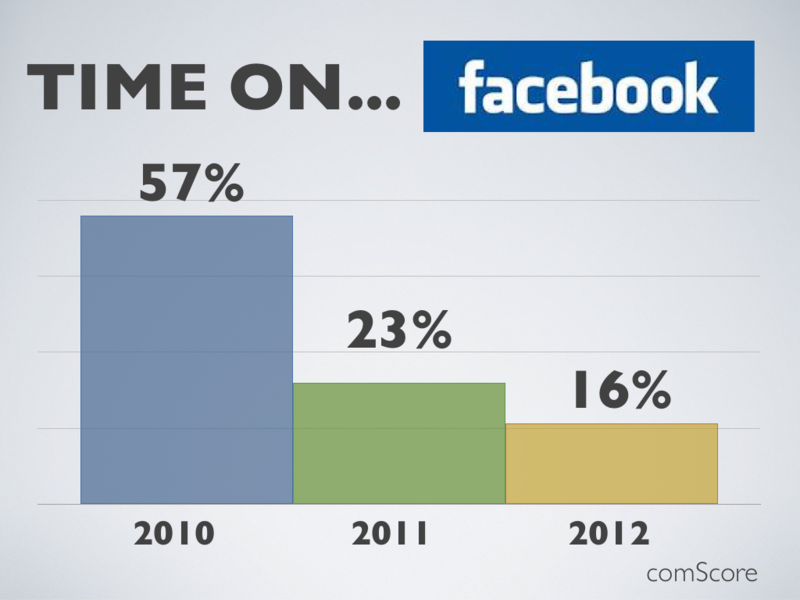 The latest user research on Facebook indicates the dominant social media site is losing some of its luster. A series of recent data sets indicates Facebook engagement is maturing and users may be losing a sense of the novelty that once came with the social networking site. New research from the web analytics firm comScore Inc. shows that unique visitors to Facebook in April rose to 158 million, an increase of only 5% from the year before. Its growth rate was down 24% from April of 2011 and 89% from April of 2010. Additional research from Reuters and Ipsos indicates 34% of Facebook users were spending less time on the site than they did just six months ago. The phone survey of more than 1000 participants represented recall and was perhaps not as accurate of a measurement as the analytics study generate by comScore. Nevertheless, they all tap into an insight that the fascination with Facebook may be peaking. Among Facebook’s core users of young adults 18-35 there are mixed reviews. Allysa Sajady is a 20-something grad student who still uses Facebook, but admits not as often. 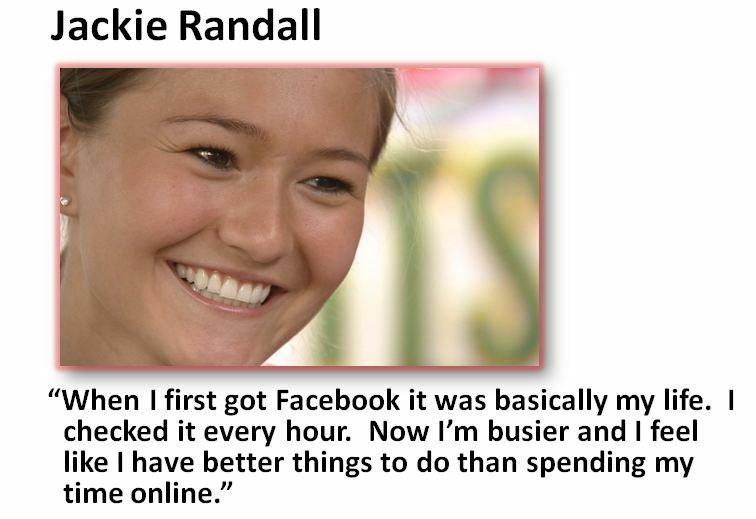 Jackie Randall is a dentistry student who no longer has the time to constantly update her friends. Wilhelm Wundt created the model to help explain the newness of an idea or product. In the model, the X axis (vertical) represents enjoyment, and the Y axis (horizontal) represents stimulus intensity or newness. The curve portrays rising enjoyment as an idea or product is new and then falling enjoyment as the product becomes overly familiar. The primary lesson from Wundt is that sustainable relationships are created when a familiar product is changed just enough to make the experience new again. In other words, the optimum position on the curve is slightly outside the X & Y intercepts. That’s exactly what Facebook has attempted to do by creating the new timeline feature and by acquiring the photo sharing application Instagram. 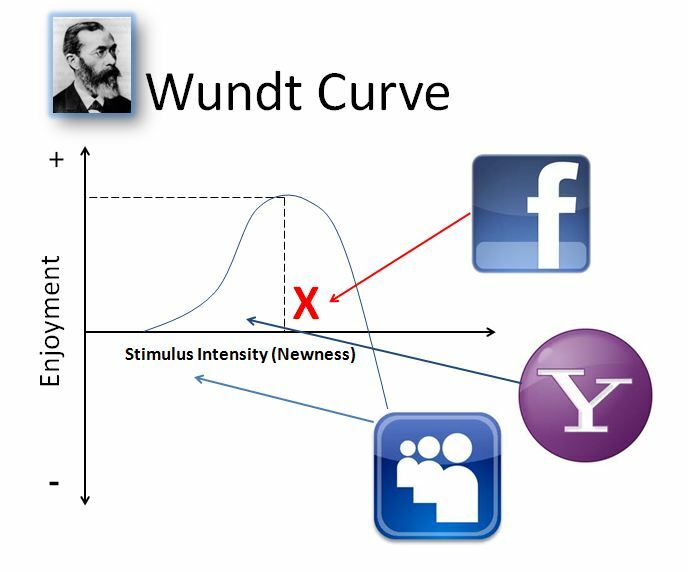 With those two moves Facebook is staking its claim on sustainable side of the Wundt Curve. Yahoo and MySpace have floundered deep inside the curve. For all of its sudden criticism, Facebook is still a behemoth brand. ComScore notes that Facebook has already collected 71% of all 221 million U.S. internet users. They spend more than six hours a month on Facebook far exceeding the four hours a month they spend on all of Google’s sites and the 3.5 hours they spend on Yahoo sites according to comScore. For those who make a living following social media trends, Facebook is far from dead. “Absolutely not,” said Dan Antonson of S-M-C Pros of Minneapolis. “I think technology is always going to trend, it’s always going to change. And I think what we’re seeing is a shift, absolutely a shift in behavior. But that shift doesn’t necessarily mean that Facebook isn’t working,” said Antonson. It may not go away, but the challenge for Facebook is to keep changing the experience enough to keep it new to the user.